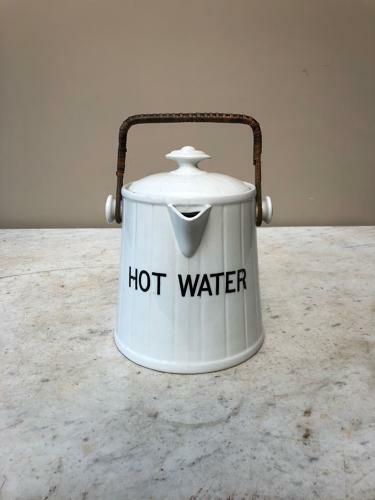 Becoming So hard to find...this is an Edwardian White Ironstone HOT WATER Jug with its Original Wicker Handle. The height measurements on the listing are with the handle down. The lid has arrows so you can easily place it back in. There is a thumb grip at the back to help hold the jug when pouring. Wonderful clean condition...with no chips or damage when you turn it over there is a star crack on the bottom but it doesnt go through but I like to mention.